Hello there and welcome to the start of the Clearly Besotted Teasers. Did you see Stephanie's sneak peeks yesterday? 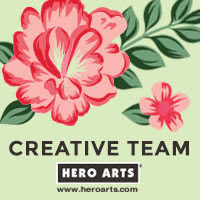 From today, until the release on the 5th, the Design Team and Guest Designer Rebecca Hoy will be sharing teasers with you. Today I thought I would share with you some encouragement type cards. My first card uses the Sky's The Limit Additions set, which combines with the original set, along with the dies. 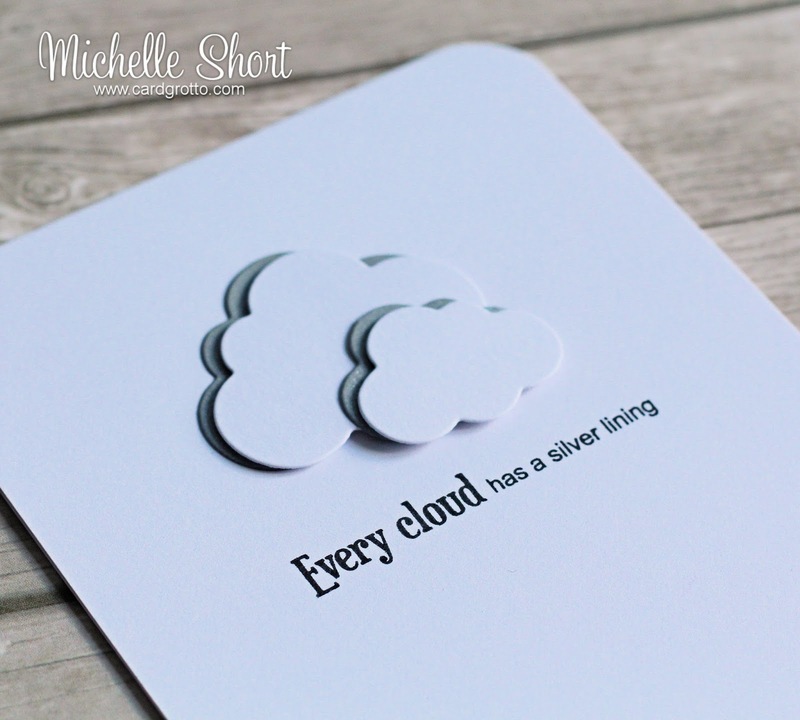 I first took the two fluffy cloud dies from the Sky's The Limit die collection (previously released) and cut these from white cardstock, as well as silver cardstock. These were added to a white A2 card base using a combination of ATG and foam tape. I took the sentiment from the Sky's The Limit Additions set and stamped this below in black ink. I finished off by rounding the corners of the card with my WRMK Corner Chomper. Here are the links to what I have used on the card. Please click the picture to be taken to where I purchased it. * Unfortunately I cannot find a supplier of the Bazzill Metallic Aluminium Cardstock that I used. It is very old so may now be discontinued. Sorry about that. My next card, also an encouragement type card, used the April Showers Additions set, combined with the April Showers die (previously released). I started off by taking a piece of white cardstock and adding the SSS Ledger Dots stencil on top of it. I also took a mask that I made which has a circle aperture in it. 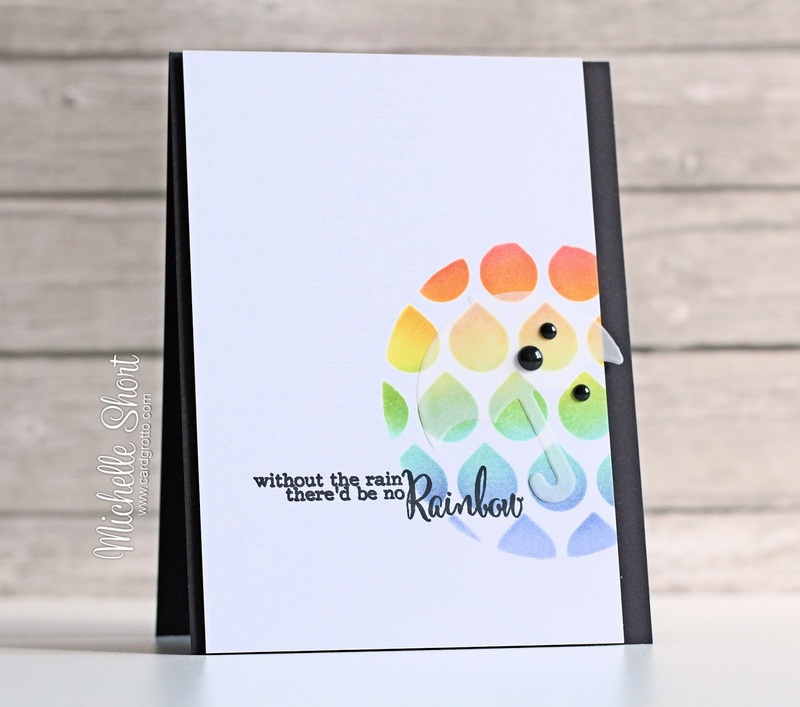 I applied various shades of TH Distress Inks (you can now buy the mini's in the CB shop) to it using sponge daubers, to make rainbow coloured rain drops. I then took the sentiment, from the April Showers Additions set and stamped this, in black ink, slightly overlapping the rain drops. I took the April Showers Umbrella die and cut this from vellum, applying Stick It to the back before cutting. This was added over the rain drops (because the adhesive covers the entire piece, you cannot see the adhesive). The panel was adhered to a black A2 card base and I finished off by adding a few black DB Sprinkles to the umbrella. The rest of the DT have been stamping up a storm (I have seen little peeks! ), so please pop over to Stephanie who will have links to those sharing today. Thank you so much for visiting me today. I hope to see you again tomorrow for more teasers. 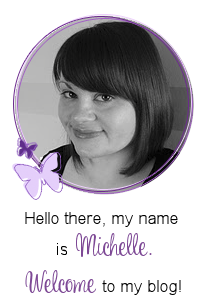 so gorgeous Michelle - I love the stencilling and little ghosty umbrella!! Beautiful cards with fabulous messages! 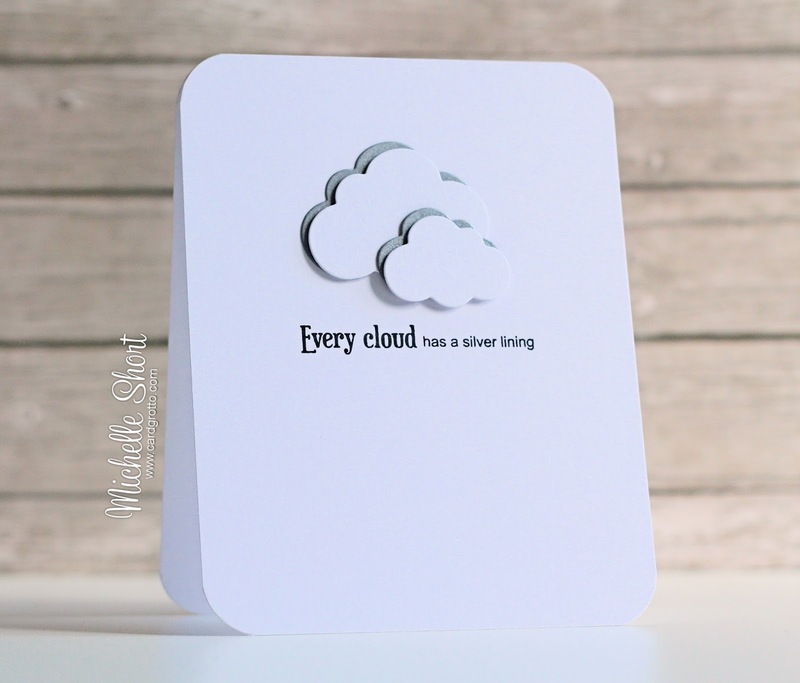 Grey backed clouds and vellum--oh my! You are such an artist, Michelle! I really LOVE your CAS style!!! Gorgeous CAS designs. I love April showers so I'm looking forward to the addition. 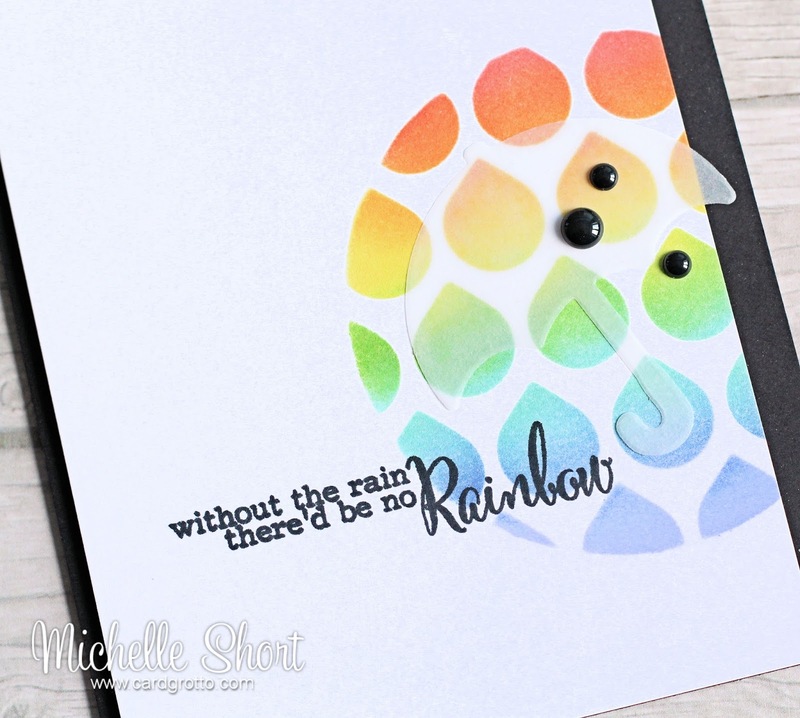 I love the new sentiments!The raindrops card is fab, those ombre drops , oh so pretty! Totally awesome Michelle!! I have to get that sentiment stamp. Its so fitting.